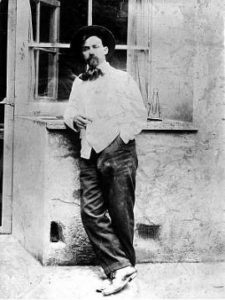 In the 1850’s, Doctor Edouard Landowski left Poland and moved to France. He had six children, Paul being the youngest. In 1882, both Paul’s parents died and he and his siblings were then raised by his uncle, Paul Landowski in a small home in Paris. When their uncle passed away, the eldest child, Ladislas, continued to raise his siblings whilst studying medicine. When Paul was only five years old, he suffered a temporary bout of blindness and so took to moulding shapes out of bread and by the time he left school, he had two passions – sculpture and literature. His first ‘sculpture’ of Saint Blandine was baked in the bread oven of Chézy-sur-Marne, where he worked during the school holidays. He also wrote dramas, poetry and kept many notes on the great literature he read. In 1893, Paul attended the Académie Julian School of Fine Art as well as spending time at the medical school, where he was commissioned to sketch dissected bodies. By the end of the century, Paul’s work was becoming well known and winning prestigious awards. He won the Prix de Rome in 1900 with his statue of David. He spent time in Italy, particularly Villa Médicis, the Academie Française in Rome. In 1906, he returned to France and moved into a house with a workshop in Boulogne-sur-Seine. He married Geneviève Nénot in 1907 and had two children, Nadine and Jean-Max, both of whom died in 1943, fighting for their country. Geneviève died in 1912. However Landowski remarried the following year to Amélie Cruppi, and they went onto two have two children, Marcel and Françoise, both of whom successfully pursued artistic careers. 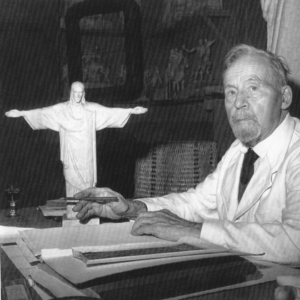 Paul Landowski fought in the First World War and was eventually awarded the Croix de Guerre at the Battle of the Somme. On his return to Paris, he started work on his dream piece, ‘Le Temple de l’homme’ (Temple to Man), which won him critical acclaim – as did the art deco figure of St Genevieve on the Pont de Tournelle in 1928, and ‘Les Fantomes’, the French memorial to the Second Battle of the Marne which sits on the Butte de Chalmont in Northern France. In 1929, he became the ‘chef d’atelier’ at the School of Fine Arts in Paris and moved to Boulogne-Billancourt. He was a firm favourite of many fellow artists and architects. He produced 35 major monuments in the city of Paris, and a further 12 in the surrounding area. ‘Christ the Redeemer’ remains the work he is most famed for. He died in Boulogne-Billancourt in 1961.